Significance Church is one of the Churches in Adelaide the City of Churches. Why is Adelaide called the City of Churches? Historically there is good reason for this name but this may not remain its name for long, especially when the established/organised Church is generally treated with suspicion, ridiculed and forsaken by the general public we must ask then will Adelaide remain the City of Churches for much longer? Most recently Channel 7 have done a mini documentary on the systematic destruction of many of the original Church buildings built in Adelaide for the worship of God and question both why this has occurred and looked at the modern trend to make the cities old Church buildings places for refurbishment and residential abodes. This state has been established on solid Christian foundations and there is no mistake in it being called the City of Churches. We hope you enjoy this article. Here are the reasons why Adelaide was called the City of Churches. Adelaide the City of Churches was firstly and foremostly a Christian State established by Christians for the free proclamation of the gospel to all who would live here. The State of South Australia was like many parts of Australia colonised by Lutherans, Puritans and the like. A group of Lutherans who had been badly persecuted in Prussia arrived in 1839. George Angas had been deeply moved by the plight of these German Christians and at considerable financial risk to himself, eventually financed all the ships to make the voyage. One example of this was On 28 July 1838 the emigrants came on board the Zebra bound for South Australia , 199 souls in number. They had to emigrate from Prussia because of their faith, and were indeed very religious. There was an address as well as prayers and hymns every morning and evening participated in by all on board the Ship. The sound of their beautiful singing could be heard across the harbour one witness said. Everyone who heard them testified to their rare gift for song. Captain Hahn was so impressed with his passengers. He apparently felt some duty to see them safely settled in their land before he sailed away, and personally supervised the purchase of their land. On January 24th 1839 Captain Hahn and his party journeyed into the Adelaide Hills to see land near Mt Barker offered by Mr Dutton, a wealthy landholder. The Captain was very pleased and personally helped in the drawing up of the land contracts. The town of Hahndorf was named after Captain Hahn of the ZEBRA. Hahndorf is the oldest surviving German settlement in Australia. A plaque commemorating Captain Dirk Hahn was unveiled on 15 August 1982. Adelaide the City of Churches is now using many of these Church buildings outside of the purpose they were originally built and dedicated for their worship of God. The city’s oldest buildings are churches, in particular Holy Trinity Anglican Church on North Terrace built in 1838, and the Quaker Meeting House in Pennington Terrace, built in 1840. The spires and towers of such churches as St Peter’s Cathedral, Brougham Place Uniting Church and Scots’ Church are still prominent on the city skyline today. Fortunately some remain in use for the purpose they were built and dedicated yet some Churches have become restaurants, bars, pubs and in some cases lay abandoned! What a travesty this is that there are not enough believers in the city of Adelaide to populate and retain these sites that were dedicated to the worship of God and to the teaching of the Scriptures. Yes many Churches of larger scale meet in much larger more contemporary buildings we know and give God glory for but to not also to keep these buildings for the purpose they were built and dedicated to seems wrong. I wonder what our Christian forefathers would have said about a Church this occurring?We also acknowledge that the Church is a people and not a building yet many Churches meet in Adelaide and have no building of their own to meet in. 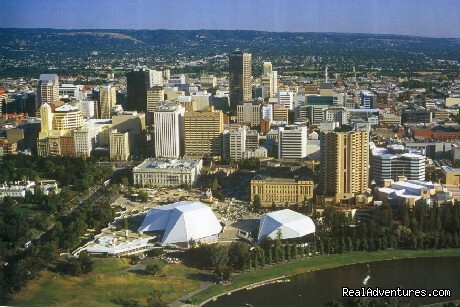 Adelaide the City of Churches was approved and founded by Men of God with a commitment to plant Churches and preach the Gospel. Lt. Colonel George Gawler arrived in the infant colony in 1838 to become the new Governor. A hero of Waterloo, was converted reading a book, Evidences of Christianity, and was determined to establish a Christian colony. Among the many Christians instrumental in the establishment of South Australia was Robert Torrens, who was to become the first Chairman of the Colonisation Commission for South Australia in May 1835. In a speech to the House of Commons in 1827, he stated he believed that Providence had commissioned them to take the Gospel, along with the gift of civilisation, to the natives of the southern continent. Almost all the directors of the South Australia Company were lay preachers. Robert Gouger, who was appointed Colonial Secretary, was a devout evangelical and was largely responsible for the success of the settlement. He wrote A Sketch for a Proposal for Colonizing Australia. When he organised the first public meeting for the free settlement of South Australia in Exeter Hall in London , 2500 people showed up. The inspiring story of the founding of South Australia is an example of God’s diversity within a unity of God’s overall purpose for Australia as a centre for world evangelism. In seeking religious liberty, the Lutheran Fathers found not only freedom to worship as their conscience dictated, but material blessings showed upon them by God the Father, Who is the Giver of every good gift. He blesses man so, like Abraham, he may be a blessing. God prepared a land and a people for Himself that through Australia He might bless the world. Our prayer is that God would again fill the Churches of this state with believers who love Jesus Christ and will lay down their lives for the gospel!